Put the sugar and egg into a measuring jug and whisk lightly. Add milk, making up the liquid to 180ml. Add to flour with pinch of salt and yeast, and knead until soft and pliable (or put into bread machine and use ‘pizza dough’ setting to make the dough without baking). Roll out into a long rectangle until as thin as possible. It should be as thin as filo pastry, but I’ve never managed it yet! Cut a 1″ strip from the long edge and place it on the edge of the dough, to give a bit of a platform for the pumpkin jam. Paint the dough generously with melted butter. Place a good, thick ‘tube’ of the jam on the ‘platform’. Fold the edges over the end of the jam, to make sure you seal it in. If the jam boils out of the case it makes a mess, so be careful about this. 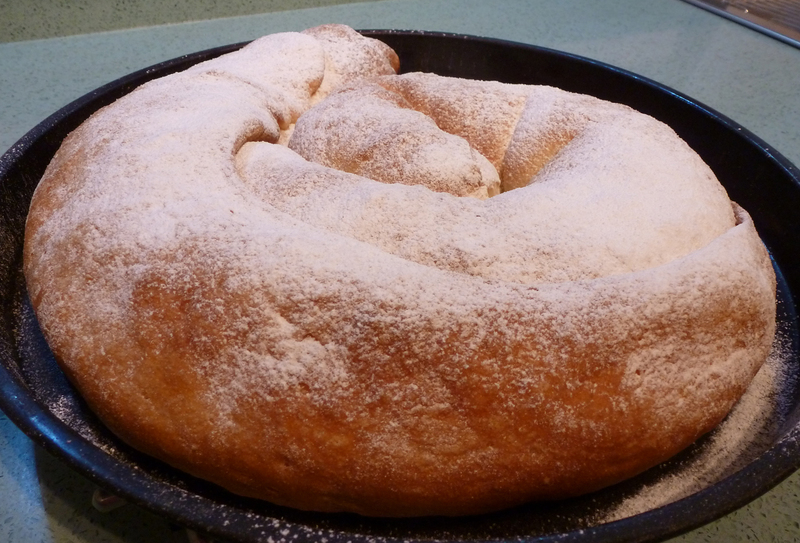 Roll the dough up round the jam, to make a long, thin ‘snake’. Coil it very loosely onto a baking tray, paint with butter and place a sheet of clingfilm loosely over the top. Leave to rise for 8 hours! This is the trickiest bit of the operation – finding an 8 hour chunk of the day – and explains why I’m writing this at 6.00 in the morning! This is such a long, slow rise that it seems to be successful at normal room temperature. One of the Spanish recipes I was trying to decipher said it should be kept in a ‘locked cupboard’ (?! ), but I find the kitchen is just fine. Bake at 200°C for 15 minutes. Allow to cool slightly and dredge with icing sugar.